Suanbo Hot Springs Special Tourist Zone is a time-honored hot springs resort in Korea. Known as the first naturally yielding hot springs that started to flow 30,000 years ago, its effect is also widely recognized. Gushing out from 100 m underground, its water is weak alkaline in nature, and the temperature is 53℃. What’s more, the water contains minerals and far-infrared effect. This is why a large number of people flock to the hot springs for treatment and recuperation. Currently, it is under the jurisdiction of Chungju-si City. At the center of Suanbo Hot Springs is Multang Park, with a shallow hot spring water stream, which is used as a foot bath. For those who are not able to take a bath, a foot bath is a good option. The foot bath is especially popular from autumn to spring. Most visitors to Suanbo Hot Springs stay at a hotel or motel in the area. The restaurants here serve pheasant dishes, the local specialty. 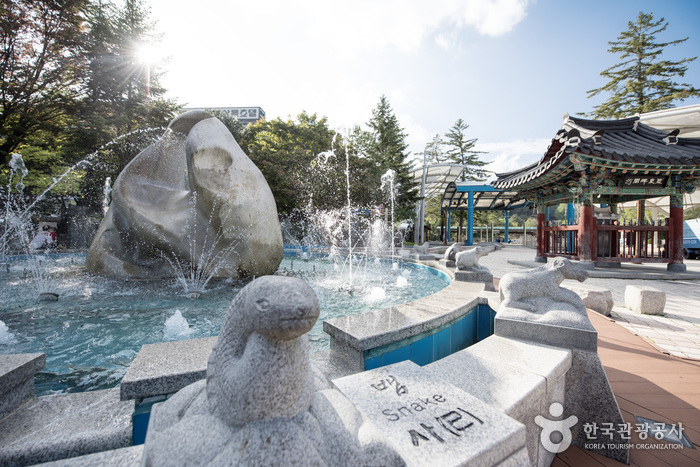 Suanbo Hot Springs Special Tourist Zone is adjacent to the national road that spans from downtown Chungju-si City to Mungyeong. Sitting in the heart of the Korean Peninsula, it is easy to access from Seoul and other provincial cities. Apart from the hot springs, there is a lot to see in this area, such as Woraksan Mountain, Chungjuho Lake and Songgye Valley. It is a great opportunity to immerse ones’ tired body in the hot spring water after a long hike.